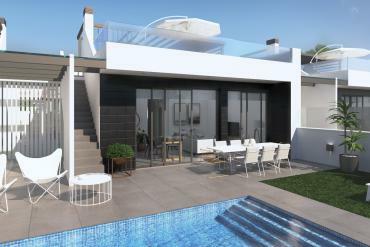 If you are looking for a property on the Costa Calida (Murcia) that combines its main qualities, we offer Los Alcazares villas for sale. Casas Espania has an exclusive catalog of villas for sale in the Alcazares so that you have the opportunity to live in Spain, thinking only of pleasure and well-being. Private pool. In our villas in Los Alcazares you will have the opportunity to shake off the Mediterranean heat with a refreshing bath. 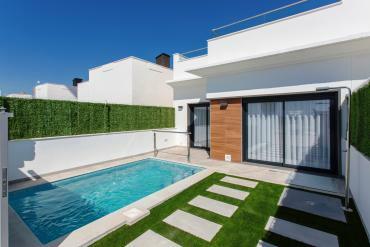 Enjoy modern and spacious pools until the time you want. Large terraces. 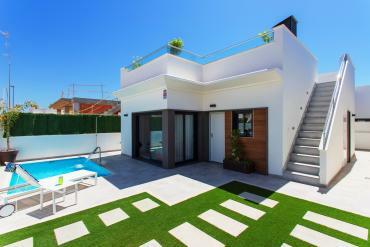 Another of the qualities of our villas are their beautiful and spacious terraces. In them you can, from enjoying a great family evening, as well as observe incredible views of its surroundings. Relax zone. If you love to enjoy moments of relaxation during a part of the day, in our villas you will have an area reserved for it. Lie down, and let time flow through your mind. Landscaping areas. 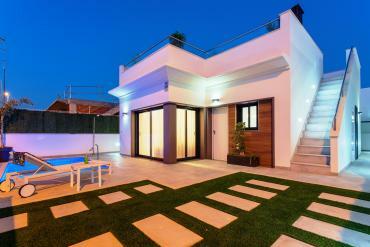 To increase the beauty of the home, many of our villas for sale offer spacious green areas. Combining a modern pool, such as a beautiful garden, your well-being will benefit. At Casas Espania we are convinced that the moment you have always dreamed of has come: enjoy the qualities of the Costa Calida. 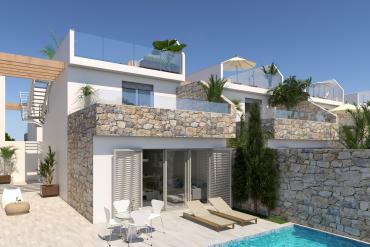 Our estate agents offer you as a formula for your well-being and happiness, the Alcazares villas for sale. If you trust us, you will not only have access to a property built with quality materials, but to a city that will welcome you from the first moment. 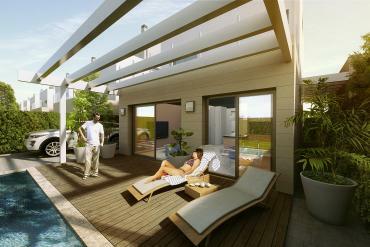 The Alcazares offers different areas of training so that you not only enjoy living inside your home. The city has beautiful beaches with crystal clear water and fine sand. In many parts of its beaches, there are fabulous restaurants to taste Mediterranean cuisine, while enjoying great views of the sea. The inhabitants of Los Alcazares are composed of residents from various parts of Europe. In this way, integration into the city will be easier because you will share areas with people of other nationalities. All seek to improve the quality of their lives, and in the Alcazares they end up finding it. 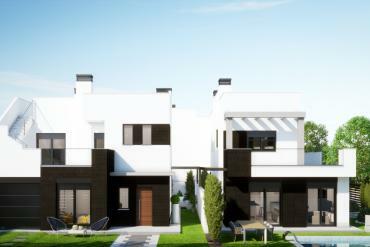 If you want to start living in Los Alcazares villas for sale, do not hesitate to contact Casas Espania Real Estate. If you want to have a meeting with one of our estate agents in Costa Calida, we are waiting for you at Avenida de la Libertad 102, Los Alcázares, Murcia, Spain.